Once upon a time, in a far-away city surrounded by mountains, a little girl dreamed of becoming a champion ice-skater. Fortunately for us, her fairy Godmother had other plans and, while preparing choreography for the ice-rink, her balletic skills were spotted and she was recommended to try for a place at the famed Bolshoi Ballet School. She was accepted and, aged ten, she set of on the long journey from her home in Tbilisi, Georgia for her new dancing experience accompanied by her beloved babushka who would care for and chaperone the young innocent girl. And the rest, as they say, is history and that ‘little girl’ who became an international ballerina, has just celebrated an unprecedented 30 years of her life on stage – and is still dancing. Nina Ananiashvili has grown into a remarkable woman, continuing to perform with fantastic style and technique – who else, approaching their half century can pirouette and fly across a stage with such grande vitesse and yet retain the fun, youthfulness – and giggles – of the young girl we all love and remember? Her technique remains flawless, imbued with deep feeling and her lovely long limbs still convey the graceful, lyrical ballerina she has been all her life, and she retains her youthful natural beauty still. She has grown into a gracious lady, greeting everyone with charm and real affection, makes excellent speeches filled with humour, is the prima ballerina of the State Ballet of Georgia, the company she also directs, teaches in such far-away places as Beijing, is the mother of sweet Elena, a lively six year old, is the wife of Georgia’s Foreign Minister and a faithful friend to thousands. So what has made her a ballet legend? The simple fact that she lives, breathes and demonstrates the finest techniques of Russian classical ballet. She is fastidious in her footwork, has the most beautiful pliable back, expressive arms and has perfect proportions and great sensitivity. She has coloured her multitude of ballet characters like the greatest painter, making huge splashes of vibrancy and colour, attending to the most miniscule of details, and embracing her multi-faceted roles with the very evident fact – she loves, and lives, to dance. She was blessed in her Bolshoi years by two great legendary dancers and coaches; she received the nurturing of Marina Semyonova who refined her every classical movement, and of vivacious Raisa Struchkova who put spice into her characterizations, making them come alive as real people to believe in. And to Nina’s credit, she was the tireless pupil, grasping every opportunity for new facets of each role. The winner of a multitude of international competitions, she has not been afraid to take risks and try different styles – she and Andris Liepa were the first Soviet dancers to be invited to New York City Ballet during the Cold War era, where both young things eagerly absorbed the finesse of Balanchine. She studied and danced with Royal Danish Ballet, danced Ashton and MacMillan with The Royal Ballet, and of course has had a very special relationship with American Ballet Theatre. However in my humble opinion, her phenomenal world-wide success lies in the fact that she has a truly loving and kind nature, and this sentiment pours out from deep inside her, influencing not only her work but filling her audiences and all those who come into contact with her with admiration. How many times was it said during this past weekend of celebrations that she was always a delight to work with, that she filled her audiences with joy and fulfilment with her exuberance, that she was always so friendly and patient to each and everyone, that she accepted direction, that she would always go that extra mile to oblige and never acted as a ‘prima’. So, no wonder she was always such a popular dancer to invite. This celebration of Nina’s 30 years of performing on stage, held on the eve of her 49th birthday, brought back so many happy remembrances of her, transporting us back to past performances with her many young handsome partners. So it was wonderful to sit and chat to all those who have different memories of her over these thirty years (my own go back to 1978 when she was still a school pupil.) Breakfasts were long as we lingered chatting with her ex-partners, Andris Liepa, Alexei Fadeyechev, Yuri Possukhov, Vadim Pisarev, Sergei Filin, Kenneth Grieve and Jose Manuel Careno, all of whom are all still as charming as ever, (though some are somewhat portlier than their dancing days.) And there were also her directors, Frank Andersen and Kevin Mckenzie, and countless friends from the US, Europe and Japan. Since the Paliashvili State Opera and Ballet Theatre is still being repaired – hopefully it will re-open in two years – the first evening saw a triple bill by The State Ballet of Georgia at the Rustaveli Theatre. The opening ballet was Sagalobeli created by Yuri Possukhov (Bolshoi now San Francisco Ballet) to Georgian folk music and played on fascinating old instruments. The piece is not intended to be a pastiche of the exciting Georgian national dance as seen through the eyes of a Russian choreographer, but to bring the essence of the pride and beauty of that style in a classical form. The women’s arms are fluid and soft, they bouree on pointe rather than ’roller-skate’ with quicksilver tiny runs on high demi-point, while the men show their bravura in spinning turns and high leaps – but not by dancing on the knuckles of their feet as in true Georgian dancing. Next came a world premiere, Tampopo, created by Estonian Teet Kask with music by Arvo Part for two men and one woman and three musicians who also play an active part in the piece. It is a madcap, Gothic, tongue-in-cheek piece which starts with a dancer crying his eyes out front of stage. Then the cellist, outfitted in stiff black angular cape and a hat with rabbit’s ears sits, stands, carries his cello around. The violinist is carried onstage like a parcel by one of the dancers, spends time under the piano, plays on her knees and intermingles with the dancers. 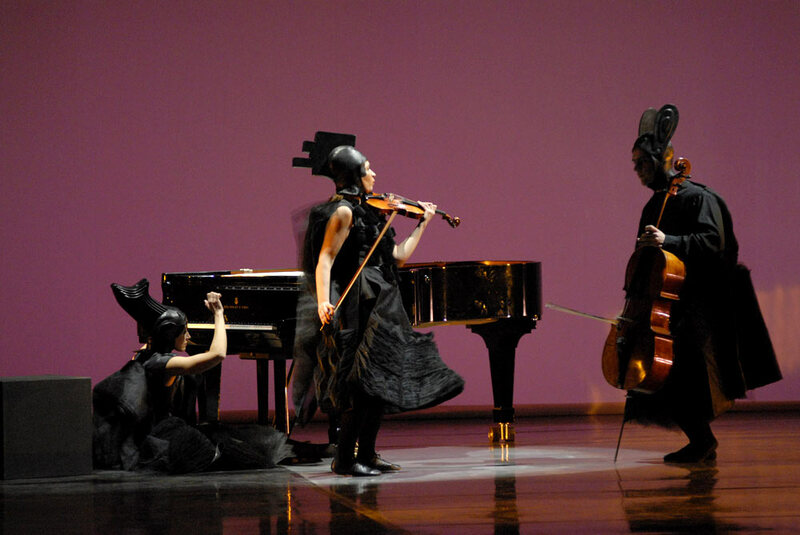 The women musicians wear voluminous angular black costumes of the same stiff material and eared hats. When all three play, a spotlight creates shadows of them on the back wall making them look like Easter bunnies. The woman (Nina) in royal blue starched skirt-like tutu with geometric bodice, black tights and jazz shoes moves with jerky movements to the scrapings of the cello until she finally orders him off stage. Vasily Akhmeteli crawls out from under the piano and is joined by Otar Khelashvili and the three of them continue to do whacky things, often joined by the musicians. The piece culminates with Nina coming downstage, doing a St Vitas dance, and laughing out loud until the lights go out, leaving a bemused audience. 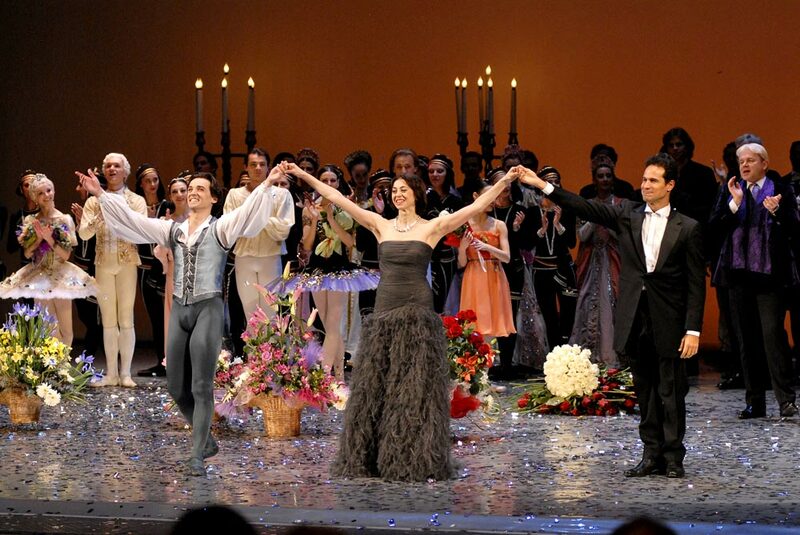 The final ballet was far more comprehensible being Ashton’s Marguerite and Armand and performed by Nina and her Georgian partner, Vasil Akmeteli. It is the perfect vehicle to see Nina’s maturity as a dancer – fastidious technique with arabesques that don’t shoot skywards but are tastefully unfurled gradually – and her deep understanding of the acting. Her face and whole body registers the puzzlement of Armand’s youthful daring at the soiree and his obvious passion for her when he initially claims her to dance, and she clearly shows the gradual budding joy that such heart-felt attention brings her until she finally gives herself in complete submission to his charms and demands. It is this inner understanding and soul of knowing her characters that lets Nina light up the stage. It was instilled in her by her beloved coach, Raisa Struchova, who taught her how to embed passion and intensity into each role. Here, with Marguerite, every thought and desire were explicitly evident especially when challenging Armand’s rejection, and the heart-breaking pleadings with his father. As Armand, Akhmeteli faced a few wobbles at the start – the small stage couldn’t offer the space to make grand entrances – but he has a beautiful line and clear technique that showed his ardour and desire though somewhat lacking in facial expression in all his dancing roles. And penultimately there was the gala – a gathering of talents and friendships that came together to celebrate Nina’s remarkable anniversary. Internationally famous dancers, ex-partners, choreographers and friends from around the world with also the presence of the President of Georgia, Mikhail Sakhashvili and several Cabinet members, (to say nothing of the mass of armed body-guards), were in the audience. And it seemed that all of the Georgian press was there – banks of cameras stood in the concert hall with microphones being popped under foreign noses asking such questions: Why are you here? Why do you like Nina Ananiashvili? The opening number, performed by Nina’s own company was an extract from the world premier of Reflections to Mendlessohn’s Symphony No. One by Yuri Possukhov. Standing in front of panels of mirrors which gave the illusion of double the quantity of dancers, twelve women and three soloists in white pancake thin tutus performed stabbing syncopated steps and flying leaps with Amazonian force. They were joined by twelve more women, this time in red tutus and it seemed as though the stage was now the setting for a pseudo chess game where the players vied for space as they sped and criss-crossed the stage. The second movement saw Nina in white tutu, her short black hair loose, and Vasil Akhmeteli in a 1920’s bathing suit, posing in front of three mirrors before bending that supple back and unfolding her long graceful limbs to dance together in more gentle mode. 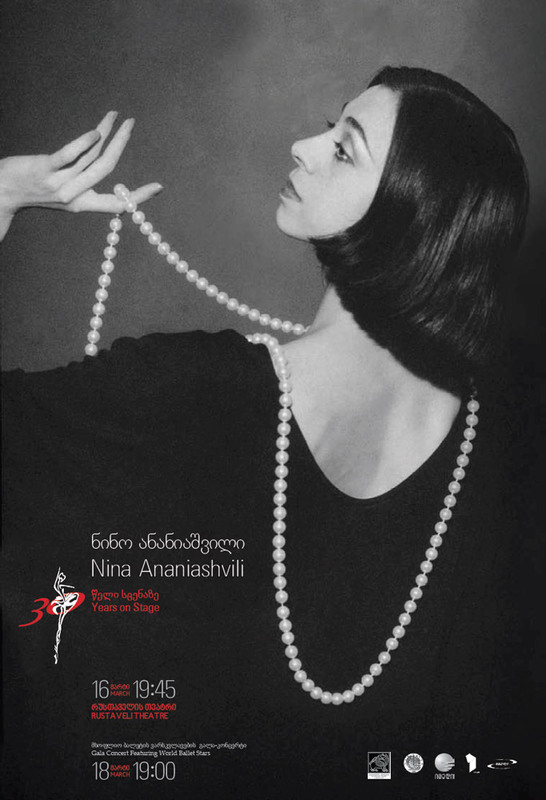 There followed a short film with dozens of nostalgic mini-clips of Nina introduced by the famous Georgian film director, Levan Uchaneishvili, who stated that the world had seen only a few Russian ballet ‘assolutas’- Pavlova, Ulanova, Plisetskaya, and also ‘our Nina Ananiashvili, a little girl who loved football and basketball but had became a ballerina and a swan’. The first guests to perform came from the Bolshoi – Dmitri Gudanov and that company’s newest principal, Evgenia Obraztsova – who performed a filigree and dainty Grand Pas from The Sleeping Beauty, gorgeously adorned with sparkling white costumes and powdered wigs. Next were the first of several Georgian dancers now working abroad. David Makhateli (The Royal Ballet) and his sister Maia Makhateli (Dutch National Ballet) danced Lavrovsky’s balcony pas deux from Romeo and Juliet. Both were beautifully fluid – she as light as a butterfly with the smoothest bourees – both possessing high easy extensions. They danced well together and nobly overcame the challenges of expressing passion when your partner is your sibling! 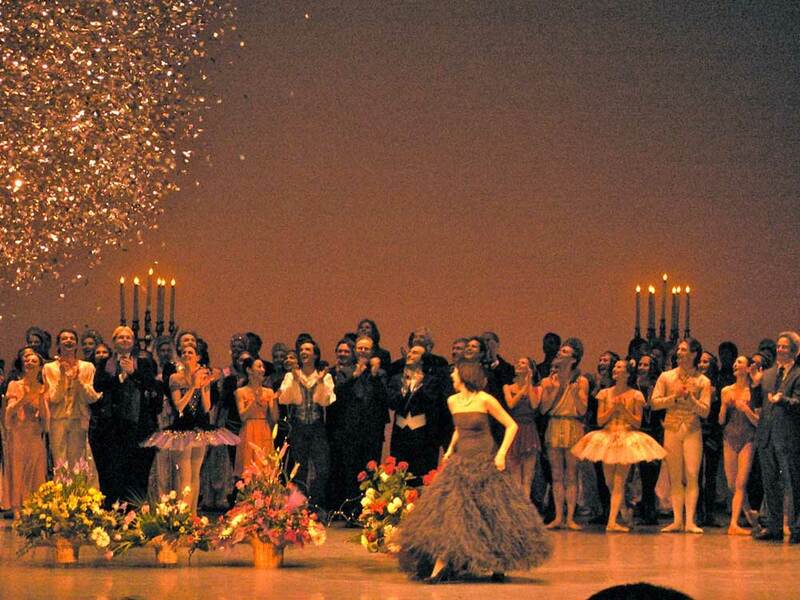 Two Chinese dancers from Lianoning Ballet – Dong Ting Xing and Ren Zhong – performed a duet from La Sylphide. Resembling little porcelain dolls, they danced with Bournonville bounce and neatness, he showing good, sharp leaps and turns, while she, light as thistledown, floated admirably, though she found it hard to express the mischief needed for her role. Someone who has no trouble communicating is Angel Corella, one of Nina’s partners at ABT. He springs onto the stage with the most wonderful smile and sense of fun and even before he had danced anything, he had won all the women’s hearts. He and Momoko Hirata (formerly with Birmingham Royal Ballet, now Corella Ballet in Barcelona) performed Tchaikovsky Pas de deux with great style and strong clear footwork, though I have never seen such lightening speed as in his solos, which always ended with perfect positioning. She kept pace with him and showed strong yet delicate action with a real sense of enjoyment. She was still in cheeky mode in the second half when she danced Alexei Ratmansky’s Waltz. Here in a luscious red and black ballgown she rejects the attentions of four elegant frock-coated men who vie for her attention – Carreno, Matvienko, Corella and Akhmeteli – leaping off stage in a grand jete as they race after her. A couple from ABT, Maria Riccetto and Blaine Hoven, delightfully performed Twyla Tharp’s Known by Heart a quirky, non stop work with demanding choreography, and this was followed by Denis and his wife Anastasia Matvienko in Gsovsky’s Grand Pas Classique. They showed fantastic balances and assurance with multiple jumps and furious turns, battling the too-slow tempi again. Yet another Possukhov creation was seen – this time a romantic, intense and demanding work entitled Bells (to Rachmaninoff’s Piano Sonata No 2 op.36), performed by two Georgian dancers who now work at Joffrey Ballet – Victoria Jaiani and Temur Suluashvili. She has a ‘rubber’ body, able to bend and mould lyrically to the demands of her partner, who is strong and attentive. The young Bolshoi couple, Anastasia Stashkevich and Vyacheslav Lopatin, performed what must now be their gala signature piece – the Diana and Acteon pas de deux. They do it well with high strong jumps and good balances but were hampered here by a very slow tempo which dragged their steps somewhat. However, they didn’t let on and were radiant throughout. Angel Corella was the last foreigner to perform, this time in Suspended in Time by young British choreographer and dancer Russell Ducker. It is a perfect piece for Corella, showing off all his pyrotechnical skills and his charismatic nature and the audience loved it. What Georgian gala would be complete without focusing on national traditions and heritage? The company gave the first performance of Gia Marghania’s Khorumi from Heart of the Mountains, and danced with great precision and pride Nina repeated her male Georgian dance seen at the last gala, with a huge beam on her face, and then suddenly she was back on stage with all her guests in a beautiful feathery ball gown as glitter tumbled down on them all. She received a long stemmed red rose from every member of her company, from her dancing guests, from her old partners and friends and later at the party, as midnight chimed, we all sang ‘Happy Birthday’ to her and President Sakhashvili tossed her into the air, just before little Elena solemnly took the microphone to sing greetings to her mother in Georgian. Our question as we left the wonderful evening was: will we be back to celebrate her 50th birthday next year and find her still dancing? We all hope so! Margaret Willis’s interest in ballet stems from a five-year stay in the former Soviet Union (1976-81) where she studied classical ballet and began writing on dance. Visiting Cuba in 1990, she first saw Carlos Acosta and has continued to follow his stellar career. She was a member of London City Ballet from 1990-3, performing principal character roles, is the author of Russian Ballet on Tour and contributed several articles for the International Dictionary of Ballet. She writes regularly for The Dancing Times, Dance Magazine and international publications. In 1986, she was the researcher for a BBC-TV documentary on the Bolshoi Ballet and in 2010 wrote "Carlos Acosta: The Reluctant Dancer" (Arcadia books).